● How to Register on BORTE.com.cn? ● How to Place Order on BORTE.com.cn? ● How to Track your order? A. 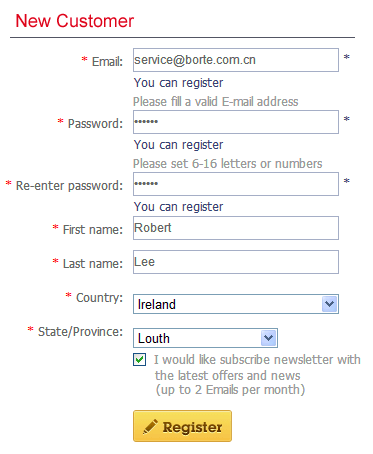 How to Register on BORTE.com.cn? 2. Click “Register” button, congratulation, you register successfully! B. How to Place order on BORTE.com.cn? Return to the home page, firstly you need to choose the product you want to purchase. 1. Choose the category in the product catalogue or type the keywords in the search field. More easily, you can contact the Live Chat to get your products directly. Click the product you are interested for more information. In the price area, you will find the lower prices base on different purchasing quantity. A. You can contact your service specialist or contact the live chat directly for more competitive prices. B. 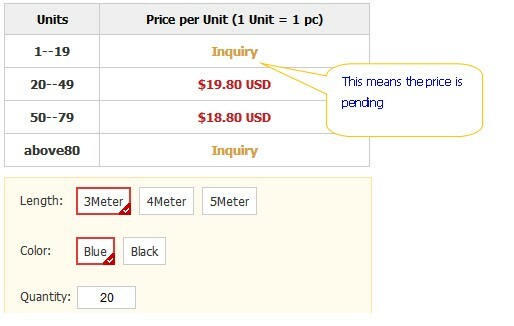 Or you can continue shopping, the prices will show “0” in order list, our customer will confirm you the prices within 1 working day. Kind reminder: at the bottom of the price area, you have to review the specification and select them in advance. After choosing the product, press the “Add to cart” button, the product will automatically be added to your shopping cart. 3. Click above “proceed the orders”, and then you come to the shopping chart. You can change the quantity of the items, or delete items here or you can back to continue shopping. 4. 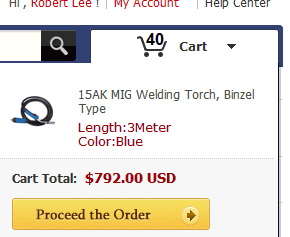 Click above “proceed the orders”. 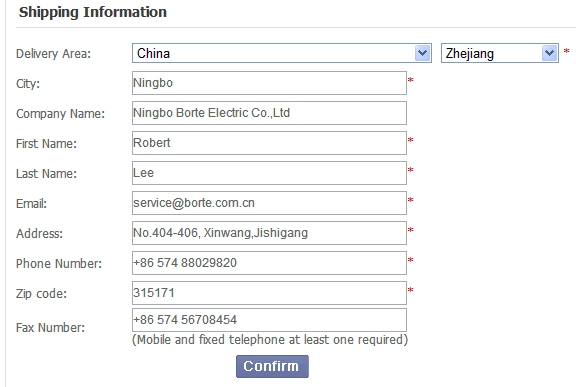 Then you will see the following form need you fill about the consignee information as a new user (no need for repeated buyer), all the fields marked with red are required to fill in, and then click “confirm” button after you make sure all information is correct. 5. And then continue to click above “Return”. The below information can show up, you just click to choose the correct consignee information and move ahead, or enter a new address. Finally submit the order. The following interface shows you had submit the order successfully to us. Our customer service specialist will contact you within 1 working day. C. How to Track your order? You can go to “My Account” to check the order status and red packet status, coupon status and pay close attention to our monthly group buy for more benefit.